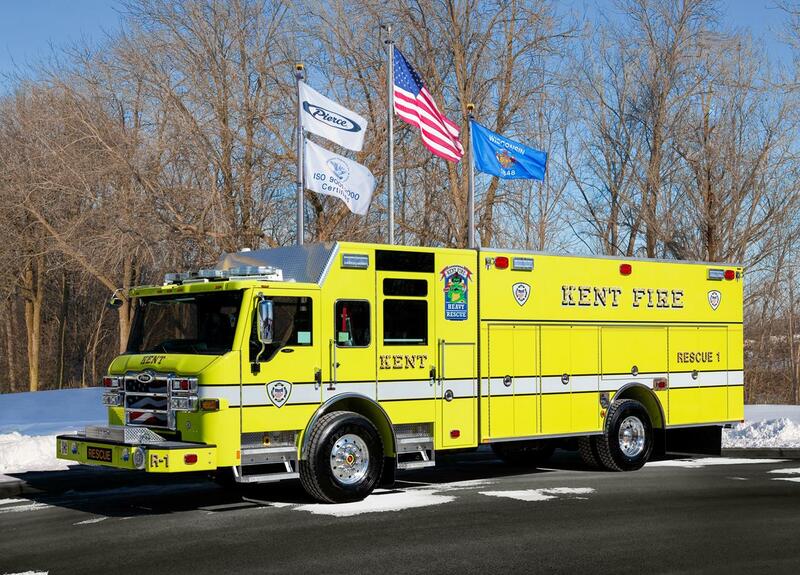 A fire truck designed and built for one department will not be the best configuration for another. It's why Pierce partnered the Velocity® chassis with the Impel chassis - to offer an excellent value with a long list of standard features and available options. The large single-piece bonded windshield & daylight windows increase visibility; the 3-blade wiper system provides better coverage of the panoramic windshield surface. At 100" wide, the Impel cab provides ample room to carry up to 10 personnel comfortably or additional compartments & equipment. The forward roof design offers a cathedral ceiling feel with increased frontal visibility & more configurable space. Large exterior door handles are generously sized to fit the firefighter's gloved hands. Wide cab doors make entry safer & exit quicker for firefighters. Gauges & switches are within easy reach of the driver without interrupting lines of sight. 1-piece, full width, lift-up hood allows for easy maintenance & fast access to the windshield washer fluid, coolant overflow, power steering, windshield wiper motor, & cab lift controls. Electrical systems, breakers, components, & modules are easy to access & service on the officer's side of cab. In-cab access for chassis fluids makes servicing easier. Massive 13.38" 120 psi steel frame rails for superior handling & reduced frame deflection. Length 60", 70" or 84" / Width 100"
Wide cab doors make entry safer and exit quicker and more efficient for firefighters. Lift and tow mounts are placed at a standard location for tow truck life systems. Mirrors are positioned to minimize both the body and head movements of the driver and increase visibility around the vehicle. One-piece, full width, liftup hood allows for easy maintenance & fast access to the windshield washer fluid, coolant overflow, power steering, windshield wiper motor, & cab lift controls. The large, single-piece bonded windshield & daylight windows increase visibility; the 3-blade wiper system provides better coverage of the panoramic windshield surface. Sales Organization: Finley Fire Equipment Co. Inc.